Benjamin Franklin National Memorial (public domain image on Wikipedia). 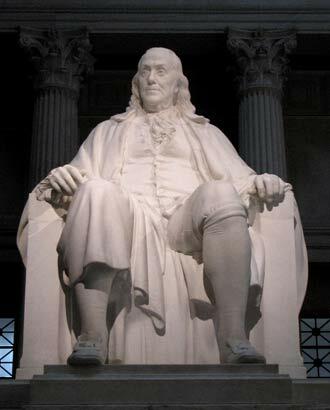 Recognized as one of our Founding Fathers, Ben Franklin was also a scientist (and inventor), an author, printer, Freemason, postmaster, civic activist, political theorist, politician, statesman, diplomat, and humorist. Benjamin Franklin was born on Milk Street in Boston, Massachusetts, on January 17, 1706 and died on April 17, 1790 in Philadelphia, Pennsylvania - there are six museums on the former site of Benjamin Franklin's home at 316-322 Market Street in Philadelphia (Franklin Court), where he lived the last five years of his life. Several other individuals are recognized as official symbols of Massachusetts: Norman Rockwell (state artist), Dr. Seuss (state children's author), Deborah Samson Gannett (state heroine), Johnny Appleseed (state folk hero), and Taj Mahal (state Blues artist). Ben Franklin on U.S. $100 bill.